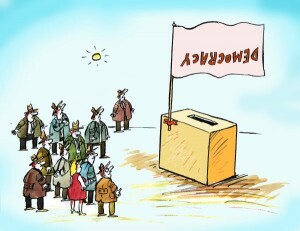 OC Politics Blog | Is the U.S. focus on global democracy misplaced? Is the U.S. focus on global democracy misplaced? In America, among the most common words used to justify policies are democracy or democratic. “Democratic” is frequently thrown in as an adjective whenever something is considered good politically (e.g., “our democratic way of life”), and “undemocratic” is inserted for things being condemned. How many times it has been invoked in discussions of the upheaval in Egypt is a good example. Americans are told we must fight for democracy around the world. Leading up to elections, politicians extol the democratically-expressed wisdom of the electorate (that those elected often overturn). We are told that the American Revolution was for democracy; that people died (and are still dying) for our democratic right to vote; that each vote was crucial; that if you don’t vote, you don’t care about America; etc. We even hear proposals to replace the Electoral College because it isn’t democratic enough. Unfortunately, while democratically determining who will be entrusted with the reins of government may generally be the best hope to enable governments to change without bloodshed (Although the precedent set by John Adams’ acceptance of defeat at the hands of Thomas Jefferson is also critical, a precedent far less common than in America), democracy is not the central core of the “good government” idea that became America. Liberty is. Democracy, from America’s founding on, has been important only insofar as it served and defended liberty. You cannot seriously read our founders’ words without coming to that conclusion (e.g., George Washington’s statement that “your union ought to be considered as a main prop to your liberty; the love of the one ought to endear you to the preservation of the other”). It is why we have a Constitution, and particularly a Bill of Rights (if whatever the majority decided “democratically” at a given time was uniformly to be law, there would be no purpose in restrictions that explicitly put certain rights against government impositions beyond majority determination). It is why the importance of liberty, far more than democratic forms, was a central theme of Alexis deTocqueville’s Democracy in America. Unfortunately, democracy need not serve liberty. Majority determination is entirely consistent with choices that destroy liberty, as both logic (how much liberty would you have in the matter if a majority vote picked your clothes each day and your dinner each night?) and history (e.g., in Hitler’s electoral landslides) reveal. Modern Americans, however, seem to lump liberty and democracy together, as if they were the same thing. They give little thought to the distinction between liberty and democracy or liberty’s primacy over democracy. Further, they give little attention to the lessons of history. So, it is important to refocus attention on this central issue. Libertarians are fighting for democracy organizing people power in every country and it certainly has little to do with this straw-man conservative version. The US military is no help to people power and should stay out, however.